All the New Ships and where will they go? With present economic circumstances one may question what will happen with all the new ships presently on order in European shipyards. Not including NCL's F3's, whose future is now indeterminate, this totals 39 ships valued in excess of $22 billion, with 89,350 lower berths (the two F3's would account for another 8,400 berths if completed). The last time the world suffered from an economic crisis of this magnitude, in the 1930s, ships that were already on order were completed while older ones were either laid up and scrapped or put into cruising, and new plans were put on hold, in some cases for many years. But what could happen this time? The main difference between today's cruise market and yesterday's ocean liner market is that ships were then the only means of international travel whereas today they are almost completely involved in the holiday and leisure market. In the 1930s world travel plummeted by huge amounts, but it is perhaps wiser to take a more recent example. In the 1990s, for example, the cruise market continued to grow in spite of a recession and the so-called savings and loan crisis in the United States. In fact, there has not been a year of negative cruise growth in the past twenty-five years, as the product has continually proven to be of such good value. Two factors will also somewhat reduce the size of the anticipated world cruise fleet. The order book has already been cut by about 8.5% (in berth terms) because of the dispute between NCL and Aker over the two F3s. If either is delivered, it is now likely to be later. And the implementation of SOLAS 2010 will also slightly reduce the world cruise fleet. A few older ships (many are already gone) that do not meet the new Safety of Life at Sea (SOLAS) regulations that come into effect in 2010 are likely to be scrapped as the cost of upgrading them will be too prohibitive for their age. The timing of these two factors may not be such a bad thing. Now is therefore a good time to look at what happened to cruising in the last world recession in the early 1990s. In 1987, on so-called Black Monday of October 19, the Dow-Jones Industrial Average dropped 22.6%, more than the stock market crashed in 1929. But what happened to cruising? Economic growth may have dropped but the cruise market continued to grow. Despite high unemployment, budgetary deficits and slow growth affecting the United States and linked economies, cruising grew significantly over these years, In North America, although there were slowdowns, every year through this period saw growth. The lowest growth year was 1989, but it was surrounded by 1988 and 1990, the two record growth years for this period. Although 1992 saw another brief slowdown, growth continued. From 1986 to 1995, 1,043 US savings and loan associations with assets of over $500 billion failed, but cruising kept growing. One interesting statistic from this period reveals that the average US cruise length did drop, from 6.4 days in 1987, 1988 and 1989 to 6.2 in 1990 and 6.1 in 1991, but then it rebounded again to 6.2 in 1992 and 6.4 in 1993. Cruising may not be recession-proof but it does seem to be recession-resistant. In Europe, and particularly in the UK, which is the source of the best European statistics, growth has also been a consistent feature of the cruise market. An oil spike in 1990 and the worst of the UK recession may have caused cruise growth to drop below double digits in 1991, but it quickly resumed and was into double digits for five out of the six years, as the figures indicate. And this is a market that in 2008 will produce close to 1.5 million cruisers. So, if we can rely on past experience, perhaps cautiously optimistic is a way to look at the next few years. Cruise lines will certainly not get the yields they want but their assets are investments that will not go away and there are more on the way. Instead of laying ships up, less strenuous itineraries will save fuel as lines try to build on-board revenue and keep cruise fares low. The mass market may be the most exposed but ships that are now being delivered are the most economical that have ever been built when it comes to unit costs, as long as they are filled. Shipyards are likely to suffer any serious downturn more than cruise lines, although how the latter will handle debts that have been incurred to build these ships is another matter. There still may be casualties. But now to those new ships. This year has seen the arrival of the Independence of the Seas, Ventura, MSC Poesia, Eurodam, Aidabella and Carnival Splendor and yet to come are the Celebrity Solstice, Ruby Princess and MSC Fantasia. With the exception of the Solstice and her lawns and Aqua Class spa section, and the Fantasia with her "Yacht Club" first-class accommodations, these are all basically repeats or refinements of earlier classes of ship. But 2009 will see the introduction of five new ship designs. The largest will be the 225,000-ton 5,400-berth Oasis of the Seas and Carnival's new 130,000-ton 3,650-berth Carnival Dream, with her wrap-around promenade. 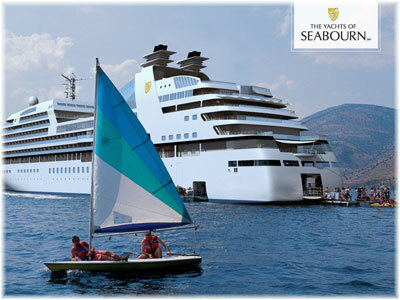 But not to be neglected are three new all-suite ships in the Pearl Mist, Seabourn Odyssey and Silver Spirit. March 2009 will see the delivery of the 8,700-ton 210-berth Pearl Mist for Pearl Seas Cruises, the international arm of American Cruise Lines. She will become the first small cruise ship to have all-balcony accommodation, ranging from 302 to 580 square feet, and will cruise Eastern Canada, the Great Lakes and the Caribbean. The only significant ship in the present order book to be built outside Europe, she is under construction by Irving Shipbuilding in Halifax, NS, but plans for a sister ship have been cancelled, at least for now. Due in June from Marriotti, the 32,000-ton Seabourn Odyssey is the first new ship for Seabourn in almost twenty years. With room for 450 guests and designed by Yran & Storbraaten, who designed the original trio, she will have 90% private verandas and be the first of a trio of such ships. At $250 million, each suite will cost Seabourn $555,000. All accommodation will be forward and all lounges aft. Whether the new trio (the second and third ships are due in 2010 and 2011) will replace the original three is yet to be determined, but that will depend on whether Seabourn can develop enough of a following to support two classes of ship. To be introduced next autumn, Oasis of the Seas will be "the ship of neighbourhoods," with her Boardwalk, Central Park, Royal Promenade and Entertainment Place and her double-deck loft suites. The ultimate development of the 138,000-ton Voyager of the Seas (1999-2003) and 154,000-ton Freedom of the Seas types (2006-08), this new design will accommodate over 6,000 cruise passengers. Builder is again Aker Yards, who have produced all six of Royal Caribbean's earlier mega-ships. At $1.24 billion, each stateroom will cost $229,630 on average. Keenly awaited by Silversea aficionados in November, and a first from Fincantieri, is the 36,000-ton Silver Spirit. At 540 passengers, she is the fifth of Silversea's newbuildings, the first four all having been delivered from Marriotti. Italian architect Giacomo Mortola is overseeing the design, which will include a new supper club, an Asian-themed restaurant and an expanded spa, while more than 95% of suites will have verandas. At $300 million, her cost per suite will be identical to that of the Seabourn Odyssey at $555,000, thus continuing the competition between the two ultra-luxury brands into another generation. Other 2009 ships will include one each for Aida, Celebrity and Royal Caribbean and two each for Costa and MSC, of which only the Aida ship and one each of Costa's and MSC's will be below 100,000 tons. The year 2010 will include another interesting crop, with two fresh designs, but it won't stop there. Although the fate of the F3s, originally due in 2010, is in the air, 2010 will see delivery of a new 92,000-ton Queen Elizabeth for Cunard Line, a new 86,000-ton Nieuw Amsterdam for Holland America Line, Oceania Cruises' 65,000-ton Marina, the first of three to take 1,260 passengers each and two 264-berth luxury ships from France's Ponant Cruises. To be named Le Boreal and L'Austral, one of the French ships will sail the Arctic, the Great Lakes, South America and the Antarctic while the other will sail Southeast Asia, Japan, India and the Mediterranean. A shot-in-the-arm for the French merchant marine, the new ships will again be all-suite, with 95% including a veranda. Other 2010 deliveries will include one ship each for Aida, Celebrity, Costa, P&O and Royal Caribbean, all continuations of earlier series. And 2011 deliveries will include a new design for Disney and series deliveries of the latest for Aida, Carnival, Celebrity, Costa, MSC, Oceania and Seabourn.